Manjushri represents all the wisdom of the Buddhas and as such has great power to rescue living beings from confusion and suffering. 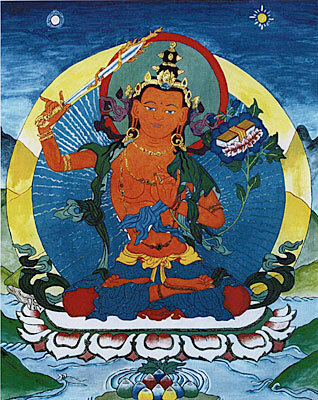 Manjushri's blessings are said to be like light which dispels all darkness within the mind. In the aspect of Orange Manjshri he demonstrates the qualities of enlightened wisdom by holding aloft a flaming sword. This symbolizes its ability to cut through the roots of ignorance. He also holds a text supported by a lotus, showing he achieved an enlightened form by following Buddha's instructions.